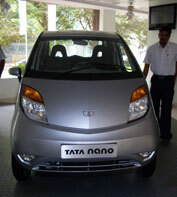 On April 1, the long awaited “people’s car” – the Tata Nano made its debut at select car dealerships in Mumbai. We went over to one in the evening and talked to (and recorded) a few of the eager people milling about. We got information on the feel of the car, how the bookings work, if tall people can fit in it, whether it really is much smoother for “elderly people and ladies” (as per the PR machine of Tata Motors, anyway) and lots more fun feedback. Very nicely done, my dear! crisp, but laid-back commentary and spot interviews. all the info very useful, although i’d have liked to know also how fast it goes and how fuel-efficient (mpg?) and perhaps environmentally friendly it is. nice background music too! @Smriti, thank you. I put in an addendum about the environmentally friendly aspect in the post’s text.